Love that garden gate that leads to the guest house. The front room has floor-to-ceiling built-in bookshelves. They furnished the 1,000 square-foot house with pieces from Steenburgen’s store Rooms & Gardens. The kitchen is small but functional for overnight guests. It has 2 bedrooms and 1 bath. P.S. Hooked on Celebrity Cottages? Mary S. + Ted D. had me at that gate to their guest house property. Their stone pathway, pergola + doorway arbor photos were pinned immediately! My friend has visited Mary’s store in Santa Monica. books, books, books – love it! The decorating is spot-on for a guest house and creative space: cozy and welcoming. Wow, I really love this one. It has such a comforting but inspiring vibe. I can just imagine family time, reading, entertaining, and creating in this beautiful space! Love it, love it. Just when I think I’ve seen every cute little guest cottage there is another sweet one pops up. Love the board & batten outside with the stone fence & walkways. The open loft with the ladder is a wonderful use of space. The adorable kitchen with the farmers sink is just the right touch. Just love this guest cottage. OMG I am swooning over every aspect of this guest house…..from the gate to the interiors to the porch. How I’d love a spot like that for my art studio and a writing area and all the books. It’s so comfortable and welcoming. You know what I like about this beautiful guest cottage, Julia? It doesn’t look contrived. Authentic comes to mind. I love it! pat: I feel differently. Is does look contrived to me. White furniture? Hope no 1 ever sis down in clothes tha bleeds. Is this really comfy or them to be creative and write and rehears scripts? Or is his an advertisement for her store’s furniture ? Regardless they don’t care about my opinion. They are rich and love it. Why did you feel the need to post such an unpleasant, nasty comment? I agree, Emma. lilkuna, why don’t you go and troll someplace else, and leave the commentary to the adults? How charming! What a nice book-filled space and wonderful guest cottage! I have this one saved as a favorite, I love what they have done. I had no idea it was Ted Danson’s guest house! They have great taste. I absolutely love what the architect did with every amount of space on the property! There looks to be seamless creativity around every corner; along with the main quarters, the guest area looks well-placed and welcoming. I wouldn’t mind being invited here for a nice early summer evening out! So cozy, beautiful and charming! UGH! What guest would ever want to leave this place, I loved it right when I saw the entrance! 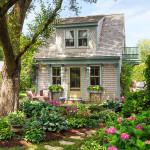 This cottage was a favorite of mine from Houzz. Nothing like Captain Beef Heart – the subject of the black and white photo in the corner of the living room – to set a mood (perhaps only understandable by my college friends). I don’t care for either of these two characters, but I could live in this space. Love the bedroom walls and the cute kitchen. Very beautiful! I especially love the floor to ceiling built-in bookshelves. Love it. Looks very comfortable, great furnishings, love the exterior, and the scale is cozy. Well done! I could easily live there. Loved it. The gate especially. Gah! I can’t stand it.. that is so perfect and beautiful. Amazing. It is so homey and comfortable. I could live there, for sure. I’m going to check out her store. Thanks for sharing, Julia! Oh, I could just move right in! I’m in love! Love it. What a great use of space. Could so escape to there. I love it and it looks so comfortable. I recognize some of the pieces from Rooms & Gardens, Mary Steenburgen’s shop in Santa Monica which is one of my favorite places to visit (except for the Rooms & Gardens in Santa Barbara that has real chickens out the back door). What a charming lovely place. I would love to spend time in there. Beautiful, charming, enchanting space. It would be a joy to spend time in that guest house. Little bit in love with this little cottage. Actually, I have big love for this tiny little cottage. I love what they have done there. The place looks so welcoming, cosy, charming, full of life, light, and creative inspiration. I love how they have made the place so personal and homey, down to earth & unpretentious. What I love is that it has so many special unique touches but doesn’t feel contrived at all. One thing that really stood out to me was the mobile light in the stairway that apparently came with poem fragments and quotes as well as blank pages so they could add their own content. Apparently, Mary added some water-colours she painted, as well as poems and song lyrics that she wrote too. Mary is so creative & talented and this place seems to exude her personality so well. Love it. Totally charming place! And as much as I am a lover of bookcases, it is the bedrooms that I find to be my favorites in the cottage. Precious looking!! Guest house? I would want to live here permenantly! Beautiful space! They have lived in Ojai since the mid-1990s at least. I lived there in 1995-1996 and they were already viewed as established residents. They seemed like such down-to-earth lovely people! And what a beautiful cottage. Ojai is Shangri-la. Oh what a lovely, charming cottage. This really strikes me as a quintessential California cottage–the type of place that I always dreamed of when I thought of owning a home. I, too, have big love for small cottages like this, but where I grew-up it became way out of the ballpark for me. Wouldn’t it be wonderful to be a guest at such a place. I would feel so lucky. I used to live in Ventura–the last place I lived before relocating to another state. I always thought Ojai was a beautiful place–I just couldn’t afford to live there. This really strikes me as a quintessential California cottage. Ok- I love your site for so many reasons but bringing this house into my world- this is why I love you/your site even more now. My husband and I are looking to build a smaller house- and this is it. This is the house. THANK YOU.